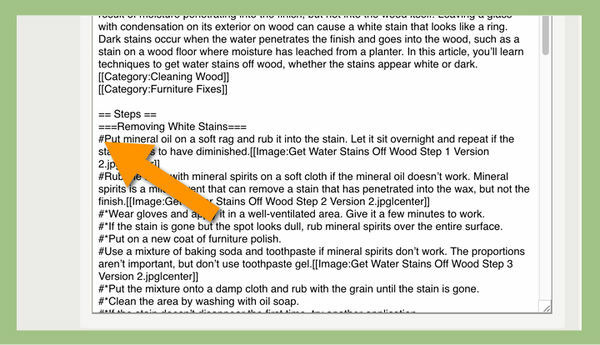 At wikiHow, we try to have all of our pages follow a consistent format for easier readability. Not all instructions lend themselves to this format, but most do. So, when you're editing pages, try to keep the following guidelines in mind, and also refer to our Writer's Guide for some more information on the wikiHow writing style. Do not insert extra line feeds or this will cause the auto-numbering to reset and create another Step 1. Identify the step with a short sentence (which will automatically be in bold) and then describe it in more detail. Ideally, the reader should be able to skim over those initial bolded sentences and get a sense of the overall method before reading for more detail. You can use verbs that are concrete/physical (such as "Cut," "Draw," "Screw it," etc), or you can use verbs that are abstract/non-physical (such as "Consider," "Be aware," "Understand," "Avoid," "Limit," etc). Avoid transitional or introductory wording. Start with a clear action verb—an activity for the person following the instructions to perform. Avoid starting with, "First," "Then," "Also," or similar introductory words. Conditional phrases are sometimes acceptable. For example: "If the top turns brown, remove it from the oven immediately." However, starting with a verb is still preferred: "Remove it from the oven immediately if the top turns brown." Avoid using personal references (I/me/my) in your steps. Instead of saying what you did, say what you want your reader to do. Each step should read like instruction or command. You can divide them into separate steps, or into sub-steps. Try to keep each step and sub-step substantial, though, rather than very brief (2-3 sentences are often ideal, but it varies depending on the topic and sentence length). Keep in mind that if the sub-steps get so numerous or long that the reader may forget which step they're on, subsections may be more appropriate (described in the next step). Make bullets on sub-steps with #*. To make subheadings, use the Advanced Editor and label the subheadings as === Subheading Title === If you find that each subsection might require its own set of tips and warnings, that's a sign that the article might need splitting. 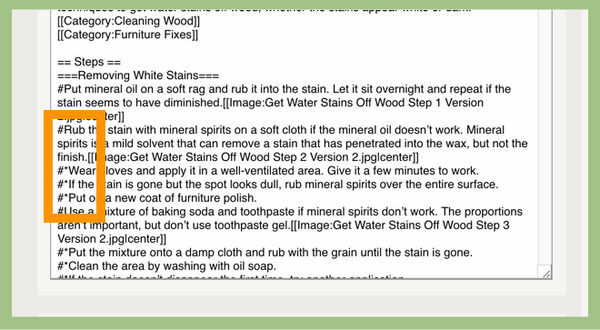 Note: Even if there are many subsections, always make sure there is a Steps section heading, or else the title will not say "How to" at the beginning, and other things will start to go wrong with the page. 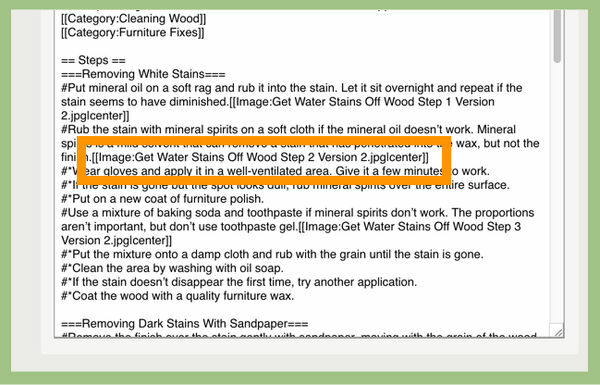 The == Steps == title is important for the engineering/layout of the article.
" Use "Method" when reading only one section allows the reader to accomplish the goal; use "Part" when reading all the sections is necessary to accomplish the goal. 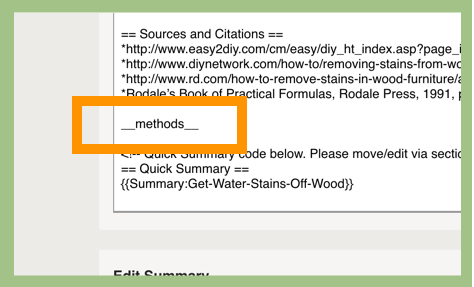 If each subsection describes a different method, put the magic word __METHODS__ at the very bottom of the article, and the header directly below the title will automatically read as methods. If each subsection describes a different part, put the magic word __PARTS__, and the header directly below the title will automatically read as parts. Note: Sometimes it will be difficult to decide on "Part" or "Method." For nuanced articles where it is difficult to tell which section header to choose, use your best judgment. For a very complicated case, you can also use additional headers within main parts or method header (using ====), but this is not advised, as it’s not ideally supported in the layout. Most image placement will be done automatically by the software; all images that are large enough will be centered and enlarged above each step. An exception applies for small, portrait-oriented images, which can be aligned to the right of the step. For more information check out How to Put a Photo in a wikiHow Article and How to Align a Photo in wikiHow. 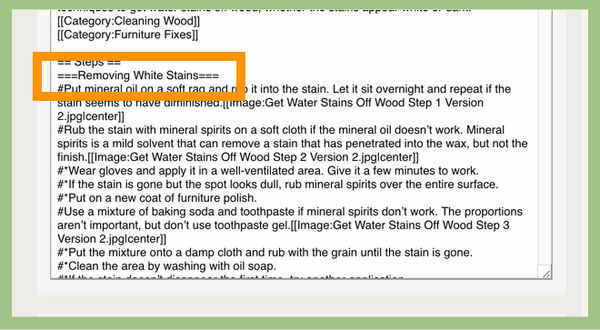 Place the image at the end of the step/substep's text (same line).